if, on any one of the days of this past week, i had scribbled down every last thing i was trying to hold in my head or my heart, i might have run out of ink. there was the phone call from school, saying the little one was sick again, please come fetch. and there was the early morning email that someone very wonderful, very brave, had died. there was the lost assignment notebook, and the lost $40. there was the rowing jacket that needed to be claimed, and the rower, too. there was the doctor to visit, and the milkshake to wash it all down. there was the carpool — or two — i was scheduled to run, and did, even though the player of soccer was felled by a flu bug. there were eight lunches to pack, and three days where a can of noodle-y soup sufficed for the one spending his days on the floor in a pile of blankets. there was dinner times four. and a brouhaha the night the little one didn’t eat much from his plate, but somehow finagled a trip to the donut shop, riding shotgun with his unsuspecting papa. then there was the rowing trip to pack for, and the deciding which grownup would drive to toledo and which would stay home for the soccer team pictures. there was the neighbor whose papa had died, and the figuring out who would bring dinner. there were tomatoes to pick before they burst, and hand-me-down hostas to plant before they shriveled and died. sometimes i wonder if maybe we’re doing too much. if maybe i’m trying to squeeze too very much into the too-narrow skins of my sausage. sometimes–and that list up above is barely the least of it–i think maybe it’s not such a good idea to try to live like we do. but then, despite it all, i find myself out in the world, gathering stories, doing the work that i love, and well i can’t imagine not getting to do that. one fine early autumn morning this week, i was tromping through parks i might never have entered alone. i was meandering along a prairie river, tiptoeing across rocks laid in the path of trickling waters. i was deep in the fronds of a fern room, all laid out by that great designer of greenspace and parks, jens jensen, the dane who fell hard for the midwestern landscape, the prairie, the rocks swept in by the glaciers, the billowing shafts and nodding heads of the grasses. yet another hot september morn found me seated beneath a crabapple tree on a wood bench in an english walled garden beside a ruddy-cheeked englishman, one with a sketch pad on his lap, and a mug of earl grey clasped in his fist. it was john brookes, i was sitting beside, the great designer of gardens english and otherwise, author of 26 books, and something of a living legend. we were talking, he and i, about the spirituality to be found in a garden, and the distinction he makes between vines and climbers, and why one belongs in a vineyard and the other is essential for ooomph and lift in a garden. through it all i was gathering bits and yarn for the most humbling sort of story to write (at least in my book, that is): an obituary, the distillation of one great and layered life into a mere 800 words. it is the writer’s job always, but especially here, to sift and pick, to harvest only the richest fruits from the tree of a life. to hold up mere threads that suggest the whole tapestry. to leave the reader gasping and grasping, understanding a life as its flame is snuffed out. oh, lord, let me do right. so, yes, despite it all, despite the nights when i did not sleep, drew the bath at 3 in the morning in hopes of quelling a raging hot fever, despite the grumbling there in the kitchen, and the hauling myself out of bed to pack yet another brown bag lunch, to simmer one more pot of oatmeal, i cannot imagine a life much richer: to learn history at the foot of a great historian, to talk gardens with one of the best in the world, to talk to the still-raw widow, to ease from her the words that will tell the world of her one true and lasting love. despite it all, i’d do it again. and chances are, soon as the page of the calendar turns, and a new week starts all over again, i will. the variations are many, but the theme is constant: i cannot imagine one half of my life without the other, and even when they bump and collide, each half makes me so much more than a whole. oy. forgive me. this might seem more of a lonely unspooling than reaching for common thread. except that every one of us likely has a corollary to the mayhem and triumph above: we live half-crazed lives, uphill climbs, because we believe we’ll get to a mountain top. there will be a moment, we convince ourselves, when all the headaches are swept away and the big picture is clear: the combined steps of our journey have taken us to a place beyond our dreams. how do you wrestle the dailiness of your life into a meaningful climb? do tell. and p.s. 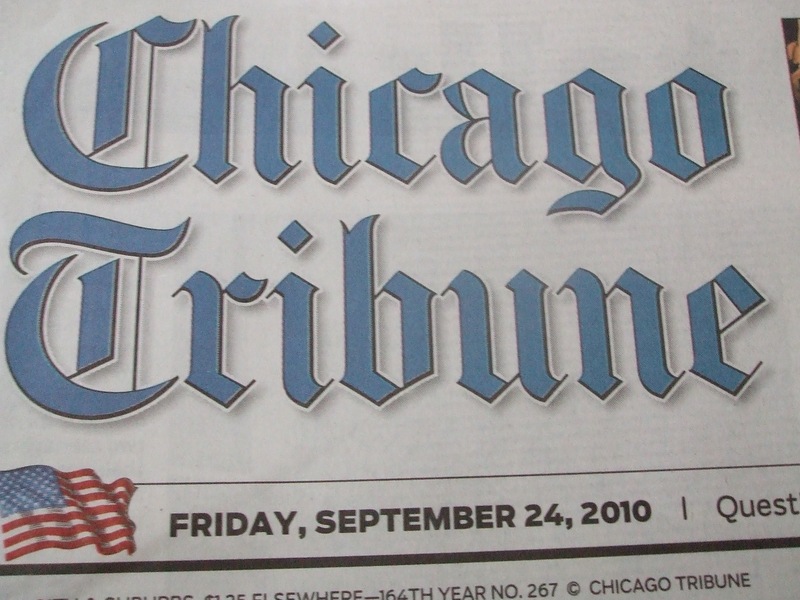 for those of you wondering about that new tribune adventure, it’s coming next week. in the news biz schedules change with the blink of an eye. so the editors held off for awhile…. it was more or less the usual bumbling that comes when a boy and a backpack are tumbled together. things that are supposed to get stuffed inside, aren’t. where they go, nobody knows. which led to the low moaning rumble that sometimes comes from a motherly creature when she is trying to decide whether to yank out a clump of her very own hair, or grab the car keys and hope against hope that one of the nice janitors will wander with mop and bucket past the schoolhouse door, just as she and her little one are banging away on the glass. not willing to spare any more of my curly white locks (okay, so maybe they’re silver), we went with the latter, the option with keys. flew through the door, into the wagon, and sputtered along till we got to the nearly-dark school. from the start, at least one of us knew deep inside that this was an exercise in utter futility. but we banged on the glass anyway. it makes for a loud impression when hoping to teach that one oughtn’t race out the school door without packing essentials. alas, no janitor. no mop and no bucket. just us banging and hoping. soon watching hope whirl down the drain, and turning at last back toward the curb and the futile-mobile. once home, i told the little one to sit down with a pencil and try hard as he could to remember the 22 words on the list. or at least four or five. 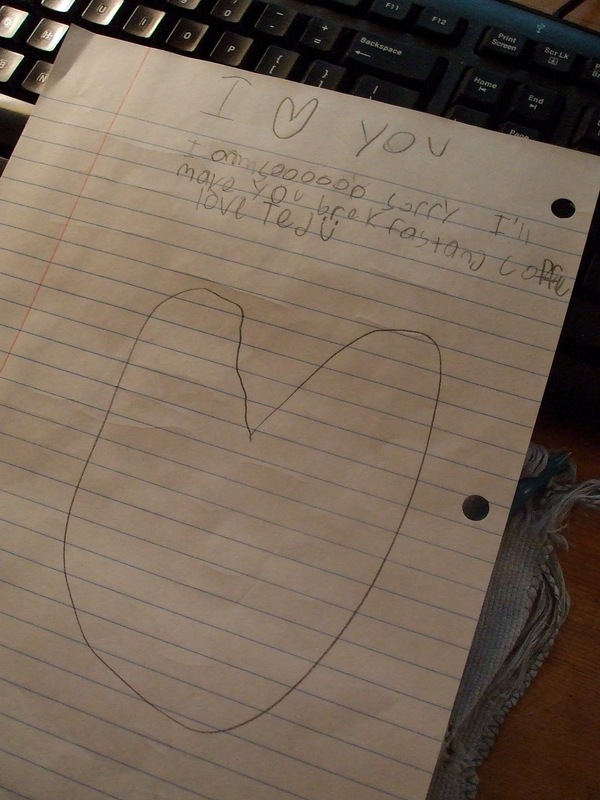 while he got to work with the pencil, i sat down to dash off a note to the teacher. explaining why the quiz on those words, the one on the morrow, might be a bust. is that all you could think of? i called to the invisible someone who had shoved it under the door. “look at it,” the invisible someone called back. is that all you could remember? i said again, frustration clutching my throat. “look at it,” said mr. invisible. be still my lopsided heart. be still my heart that couldn’t care more for the two extraordinary spellings there in the note. through tears i leapt up from my chair. chased that irresistible speller straight up the stairs, where i grabbed him and kissed him till he melted to giggles. then i stood there melting myself. that he would leap straight to “sorry,” rather than pout or huff ‘n’ puff about how it was only some words, lined up in rows. the child had grasped, without pausing for punctuation, without worry for vowels in absentia, the heart and the soul of atonement, of yom kippur, really, that somber string of breast-beating moments that is launched at sundown tonight. it is all about actively mending the brokenness. not just whispers of hollow apology, but picking up thread and stitching sanctified wholeness. weave and reweave. just yesterday i was talking to a wise and wonderful rabbi. we were talking about teshuva, the jewish principle of repentance–repent and repair–the centerpiece of these days of awe, of the day of atonement. the words of the prayer of contrition of my little-girl days. catholic or jewish, jewish or catholic–is it not all a great swirl, a soup of humble i’ve-wronged-and-i’ll-right-it? and it came tumbling in through the crack beneath my door last night, the wise little confessor with the wobbly printing, and the words that couldn’t have been cobbled together in more heart-melting fashion. brekfast and coffe and sorry and love. and isn’t this some sweet season of awe, when the 9-year-olds among us can teach as profoundly as all of the rabbis? when the scribbled words on a half-crinkled page of notebook paper can speak to us as loudly as the words of the great books of our ancient traditions? oh, my most blessed child, you’ve taken my breath straight from my lungs, from my heart, from my whole. we thought it was spelling words we were missing last night; in fact we found deepest religion, a subject often best taught by the youngest and wisest among us. the ones whose hearts are, still, tethered to heaven. may this be a blessed season for sooooo sorry for you and the ones you most love and forgive and forgive…..
dear chair friends, an announcement of sorts: after years of wishing it seems i am about to start cobbling chair sorts of thoughts into columns for my newspaper. only you won’t find them in the pages of the actual paper–not yet anyway–but rather over on the tribune’s website, in a corner called tribYou, under the heading “lessons for life.” my ramblings will find a place there once a week, on one particular day, though that’s not yet been decided. and while it won’t be nearly as intimate and close to my heart as the words that spill here, nor will it be as sacred a circle as the ones who find their way here, it will be something altogether new for a newspaper, and it is borne of the spirit of what we all celebrate here–the knowing that life offers lessons in the everyday, in the wisps of moments and thoughts and unfoldings. i’ll let you know soon as the first one is posted. but before we go, one question for today: do you have a story to tell about an i’m sorry that wholly took your breath away? the beautiful thing about leaping into a religion that’s not your own, is there is no rule book. well, there might be a tome or two on the shelves, but when you’re inventing, you often concoct as you go. oh, sure you ask zillions of questions, you turn to the texts, pore over pages, searching for answers. but plenty of times, you go with the zeitgeist and, frankly, you wing it. 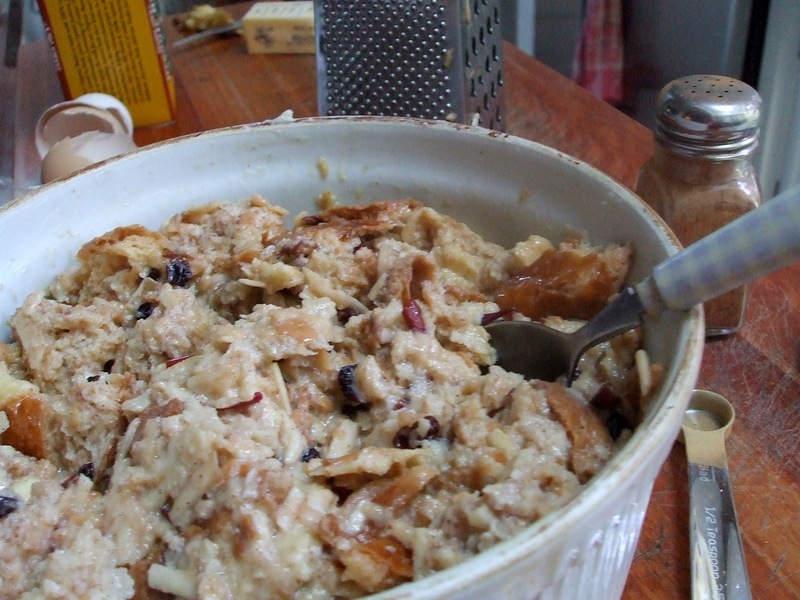 and so it was i bounded out of bed yesterday morn, on the dawn of the new year, rosh hashanah, and set out to make rosh hashanah bread pudding. now, nowhere in the cookery books will you find such a sweet and pudding-y dish. there is no step-by-step guide to a sweeter morning than the usual cornflakes and cow’s milk. ah, but like many a someone embracing something that’s new, that’s just a touch foreign, exotic, i can’t get enough. give me a rosh hashanah prayer about morning stars and particles of dust floating on the wind, and i am swooning in my pew, thinking to myself, by jove, they’re talking to me, those ancient hebrew poets, the ones who thousands of years ago carved out these words to speak to my heart, here in the waistband of america, where leaves are just starting to rumble with thoughts of shedding their greens, too early just yet to unfurl great bolts of color. truth is i tingle, through and through, here in these days of downright awe. i am not a jew. but i love a jew. married him. bore our children. am raising those children in a house that is bathed in the best of two great and rather old faiths: we are catholic and jewish. and this time of year, in these sacred golden-dripping days of awe, i cannot get enough of a whole-body immersion. i am cooking it. praying it. setting the table with it. poring over the verses with it. inhaling every last drop of it. everywhere i turn, there is awe. and it is sweet. let’s start with the light: have you noticed the great kaleidoscope that is the turning of season has cranked it just to the north a notch, and now the sunbeams that hit us are amber molasses, tinged with spoonfuls of honey? why yes, they drip on my bed pillows, my pages, my old creaky floorboards. and then there’s that charge in the air, the one that has us un-sashing the windows, pulling back shutters, clearing the way so that cool night breezes might billow in, that air that seems at last purer and crisper, more certain to clear out our lungs from all the sticky still jungle air that took hold in the long hot summer. but mostly, there are the prayers and the knowing now what i’ve always known: this is sacred time, new time, time that deeply matters. the days when our steps are counted, our deeds recorded, our fates inscribed in the holiest book. God is paying attention, rapt attention, and so too must we. thus, as if to upholster the year, to tilt it toward sweetness the whole way through, we stir it in in great dollops. a handful of raisins here. a bee-bumped macintosh chopped and grated over there. we are watching as honey drools from a spoon. and wiping smudges, sticky, off from the table. tonight this old house will be filled. the table as crowded as it knows how to be. if we could have layers of table, we would. i would invite everyone i have ever loved, and then some. and just as the sun slips over the ledge and sacred twilight comes, having stirred the stews all night, and having set out my grandma’s silver, and the glasses of cobalt blue, i will strike a match and kindle the lights. i will call on the legions of saints and angels who march behind me wherever i go. i will call on rachel and leah and rebekah. i will look over (not down anymore, for the top of my head no longer makes it even to the cusp of his shoulders) at my firstborn, and gulp back the tear that comes with knowing he’ll not be home next year, or for years to come for that matter, on these sweetest of days upon days. i will be humbled and filled all at once. will marvel that i, a deep quiet catholic, was somehow swept into the river that bathes me so richly, so wholly, so anciently. calling me back to where i must have once begun. i count myself among the blessed, the ones who are stirred by the ancient hebrew poets, a people who marked time by the stirrings on the bough and in the field. who kept time by the heavens, the night star and moon. i read these rosh hashanah prayers through dual lenses, and in them i find such powerful majesty, such knee-buckling knowing of the intricacies of the human heart. today this meander is merely an unspooling, no deep lesson or question, other than this: what is it of this time of year that heightens in you a deep sense of awe, no matter your religion? p.s. that rosh hashanah bread pudding? nothing more to it than torn-up bits of the night before’s raisin-studded challah, with a fat granny smith grated into it, along with a handful of even more raisins and cranberries (why stop when studding your pudding?) i had promised rosh hashanah bread pudding to my little one who loves a good reason to leap out of bed. and thus, once stirred from my dreams, i had little choice but to come up with a version that lived up to the promise. some nights it’s a miracle i don’t land in my seat at the old kitchen table with sweaty beads of saltiness pearled across my brow. which i’m sure would be met with that wordless but emphatic refrain put to good use at so many kitchen tables across the land: the chorus of eyeballs rolling in counter-clockwise direction. they’ve no clue, really, just what it takes to get that one square meal roundly on the table. take the other night, for instance (in the back corners of my brain i believe i hear ol’ henny youngman snappin’, “take ’er, please.” to which the snare drum responds, ba-dum-ba-dum. end of comic interlude). back to dinner: so it was a wednesday, the one worknight when i am home early enough to fend for myself (the other two i lean heavily on my mama, who has made it her business to plan and shop and cook and then try ardently to coax vegetables and meat down the throat of youngest child; but that’s another tale….). the aim here was simple: eat before 8 o’clock, so there was half a chance of getting little one to bed before, say, midnight, his preferred hour of surrender to slumber. 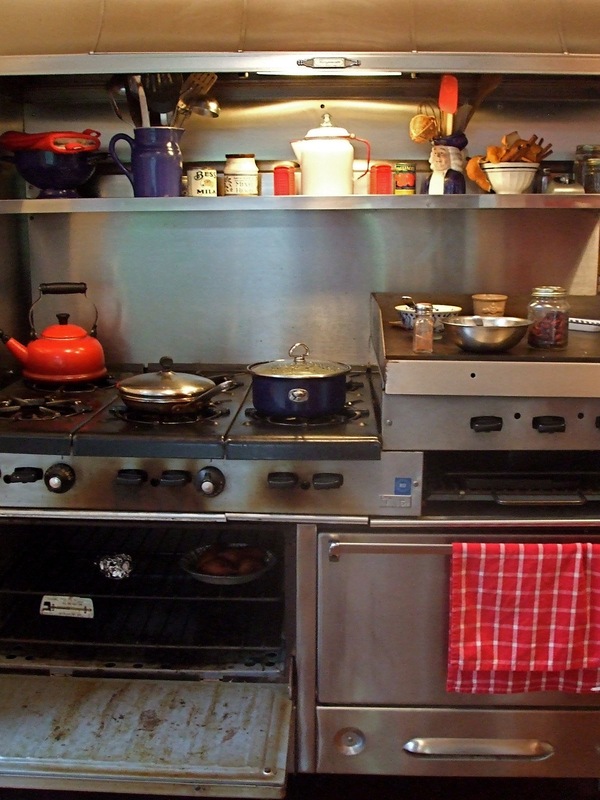 problem was, as there so often is, i had two carpool runs, one from 5 to 5:35, the other from 6 till 6:30.
that left 25 minutes squeezed in, or, plan B, cooking interruptus, that ill-conceived attempt to do what can’t be done. on the way home from news-gathering some 35 miles away, i found my car swinging past a grocery store where apple-studded sausages are sold. a wee noise in my brain reminded me that young children had recently declared moratorium on all sausages except for apple. suddenly, and without warning to driver, the car was screeching off of six-lane throughway and into parking lot. with eyeballs glued to watch, keeping track of countdown till the hour when call was coming from new york, for next round of interviews for news-gathering purposes, i fairly sprinted through the aisles. panting at checkout, the checker asked why i seemed so rushed (note to self: do better job of camouflaging frantic harried state; it’s apparently not so pretty). once i’d wrapped up all newspapering for the day, i set to housewifery. catching that rush, that tinge of autumn in the air, i’d dreamed up a menu nodding toward impending crispness. stewed apples were first up, so i chopped and chopped. and realized right away i’d forgotten the second of two items on my ad-hoc grocery list: the apple cider that takes stewed apples up a notch. oh, well. my improvisational back-up plans were bombs, according to the young boy who appeared at the front door, wearing backpack and familial tendencies. he vetoed a splash of orange juice, lobbied hard for a gurgle of gingerale, but instead i took the coward’s route, and added pure plain water. just a tad. and shakes of cinnamon, to boot. then, going with apple theme, i decided to slice and saute a round or two. sprinkled with cranberries, we had a fine blanquette (the french version of blanket) to dump atop the sausages. and, let’s see, what about the baked sweet potatoes? how to get those done, when they need an hour in the oven, but that hour is one in which a.) i won’t be home and b.) they’d be blackened if i let them run their course while i run mine? and thus was realized this: the need for carpools one and two to be interrupted by a two-mile detour back to home, for the mere purpose of turning off the oven at appointed hour and wrapping spuds in foil. sort of like aluminum pup tent, or shiny holding pen for yams. all this to say, it’s nothing short of olympic-level competition to get dinner on the table, for even a mere humble family of four, a sum just shy of the national average. and, mind you, most folks aren’t such fools as i, and willing to charge hither and yon for mere purpose of sitting down to multi-colored plate of early autumn harvest. so once again i ask, what’s come of the sacred time at end of day, when all are gathered to sift through the hours since the dawn, the highs, the lows, the questions? it takes near stubborn dedication to the prize. there are obstacles aplenty to knock you off the course, to steer you to the drive-thru, to tempt with dinner ala styrofoam clamshell. ah, but there are fools, and i am one, who will leap through hoops, stumble over hurdles, even land kerplop in water pits and puddles. if that’s what it takes to score even five placid minutes at the table. before the milk gets bumped, and the vegetables are picked at. but for those five sacred minutes, when we join hands, breathe deep, and whisper thanks and blessing, i will do what needs be done. even if i look to some as if i’ve just run through the sprinkler, and come to dinner in desperate need of bath towel. do you find it nothing short of olympic level challenge to gather serenity and deliciousness at the dinner hour? what odd hoops have you leapt through? tell us of the moments when you know it’s worth whatever blood, sweat and tears are required?